The small town of Salem, Massachusetts has a rich history. It was one of the first places in North America to be settled by the English way back in the 16th century. Along with Plymouth and Boston, it was part of the Hudson Bay Trading Company and settlers had to carve out their lives in the midst of an American wilderness previously untouched by European hands. Salem also was the location of one of the most famous witch hunts in the New World, with several young women accusing the wives of rich landowners of practicing witchcraft (as supposedly taught by a Haitian servant.) The Salem witch trials resulted in several executions of both men and women, and became a cautionary tale of mass hysteria and religious extremism for centuries to come. Nowadays, the town banks on its "occult" background, growing exponentially with tourists around Halloween, and anyone with even a passing interest in Wicca or witchcraft seems to gravitate there. Given all that history, Salem seems a really screwed-up place to set a massively multiplayer game focused on crafting and building. But that's exactly what makes Salem one of the most interesting concepts that I've heard for an MMO in a really, really long time. When you die in Salem, you stay dead. It takes a long time to make stuff, which is shortened by your tools and how many friends you have helping you. You level by eating and drinking. In places of civilization, the area is full of light. As you move into the wilderness, it gets darker and more mystical enemies will show up. Building certain structures like churches will increase civilization, i.e. make the area brighter. Practicing witchcraft (placing curses, etc.) will produce its own "scent" which can only be detected by those with the correct skill. Bjorn Johannessen and Frederik Tolf currently run a game called Haven and Hearth that is kind of like the first draft of a lot of what Salem intends to be. But where H&H feels homemade with its simple 2D graphics, Salem has the full support of Paradox Interactive behind it and a full 3D interface. It's meant to run on one server where everything is persistent for all players, but they may add more servers after launch. 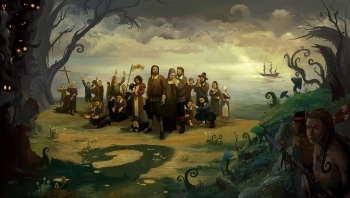 Salem will be free to play, and I'm interested to find out how it is monetized without jeopardizing the balance. Unfortunately, the publisher isn't ready to share that information just yet.